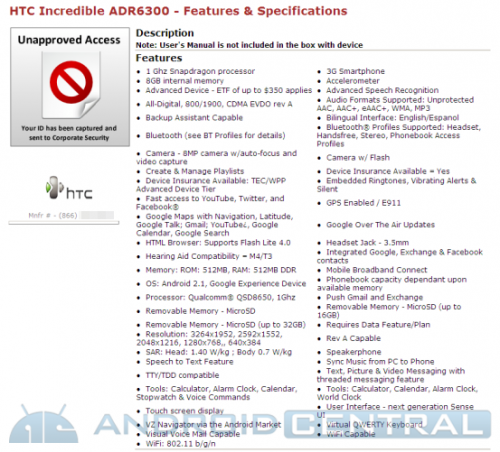 HTC Incredible Specs for Verizon Leaked? There is no debate as to whether or not the HTC Incredible is coming to Verizon, and it’s coming to Verizon very soon. The only debate on the table is when will the HTC Incredible arrive, and when will Verizon announce the HTC Incredible and also the much anticipated Nexus One phone. I’m also anxiously awaiting an iPhone / Verizon marriage announcement! Until then, there are some HTC Incredible specs that have supposedly been leaked – although with the proximity of the HTC Incredible release date, I question the “being leaked” claim.